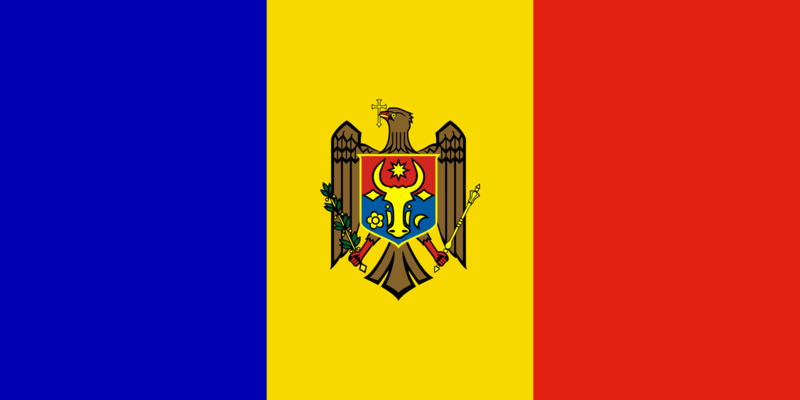 The state flag of Moldova is a vertical tricolour of blue, yellow, and red, charged with the coat of arms of Moldova (an eagle holding a shield charged with an aurochs) on the centre bar. The obverse is mirrored. The flag ratio Until further provisions, the State Flag of Moldova is used as the national flag and ensign as well, that is, civil, state and war flag and ensign. The blue, red, and yellow tricolour of Moldova is identical to the flag of Romania, reflecting the two countries’ national and cultural affinity. On Moldova’s flag the yellow stripe is charged with the national arms. Like the Romanian coat of arms, the Moldova arms, adopted in 1990, features a dark golden eagle holding an Orthodox Christian cross in its beak. Instead of a sword, the eagle is holding an olive branch, symbolizing peace. The blue and red shield on the eagle’s chest is charged with the traditional symbols of Moldova: an aurochs’ head, flanked by a rose in dexter and a crescent in sinister, and having a star between its horns, all of gold. These two national flags are also very similar to the flags of Chad and Andorra, which are all based on vertical stripes of blue, yellow, and red.